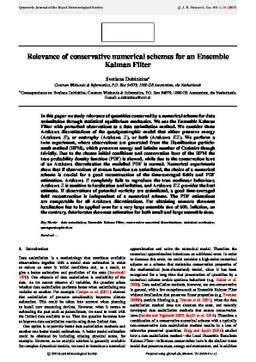 In this paper we study relevance of quantities conserved by a numerical scheme for data assimilation through statistical equilibrium mechanics. We use the Ensemble Kalman Filter with perturbed observations as a data assimilation method. We consider three Arakawa discretisations of the quasigeostrophic model that either preserve energy (Arakawa E), or enstrophy (Arakawa Z), or both (Arakawa EZ). We perform a twin experiment, where observations are generated from the Hamiltonian particle-mesh method (HPM), which preserves energy and infinite number of Casimirs though trivially. Due to the chosen initial conditions and conservation laws of the HPM the true probability density function (PDF) is skewed, while due to the conservation laws of an Arakawa discretisation the modelled PDF is normal. Numerical experiments show that if observations of stream function are assimilated, the choice of a numerical scheme is crucial for a good reconstruction of the time-averaged fields and PDF estimation. Arakawa E completely fails to reproduce the true nonlinear behaviour, Arakawa Z is sensitive to localisation and inflation, and Arakawa EZ provides the best estimate. If observations of potential vorticity are assimilated, a good time-averaged field reconstruction is independent of a numerical scheme. The PDF estimations are comparable for all Arakawa discretisations. For obtaining nonzero skewness localisation has to be applied even for a very large ensemble size of 600. Inflation, on the contrary, deteriorates skewness estimation for both small and large ensemble sizes.